The Office of the Vice Chancellor for Research oversees, develops and supports UNC’s $1 billion research enterprise. It sets strategic priorities for research, manages proposals and awards, provides research infrastructure, identifies funding opportunities, develops research teams and partnerships, and oversees regulatory compliance, ethics, and conflict of interest management. 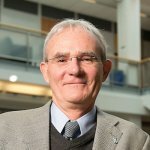 Terry Magnuson, Sarah Graham Kenan Professor and founding chair of the UNC Department of Genetics, became UNC’s vice chancellor for research on July 1, 2016. In this role, he leads a campus-wide research program that attracted nearly $1 billion in contract and grant funding in fiscal 2014; connects academic units across campus with university priorities; and manages research support offices as well as 14 centers and institutes. Bridget Riordan is the Executive Assistant for the Vice Chancellor. Ms. Riordan is responsible for the Vice Chancellor’s calendar and works closely to help prepare and review presentations, reports and travel coordination. Jo Ann Gustafson serves as Director of Operations and Senior Assistant to the Vice Chancellor for Research. She is responsible for the management of all administrative functions. These include day-to-day management of all activities and procedures and oversight of budget and personnel administration within the organization. Ms. Gustafson serves as the HR Officer for the Research Division. Tonya Watkins serves as Director for Research Division Financial Services. She leads the finance, accounting, budget, and financial services operations of the second largest research generating division on campus. She directs the planning of shared financial and research administration services for the research division as a whole, and oversees the provision of these services to OVCR administrative offices, centers, and institutes. Ms. Watkins also represents UNC Research on campus finance committees, and serves as the MOU for the division. Leslie Ray supports Associate Vice Chancellor Andy Johns and is responsible for all correspondence and the distribution of information to research senior staff and other administrative personnel.